The Department of Education has been handcuffed as it works to provide guidance on school safety following the murder of 17 students at a Florida high school due to continued Democratic obstruction of nominees for its top leadership posts. One appointee who has been waiting months to be confirmed is Frank Brogan, who happens to have a personal experience with school shootings. Brogan was working in 1985 as an assistant principal in a Florida middle school when he spotted a student waving a gun around, according to an Associated Press account. Brogan chased the student down and attempted to talk the student down, but ended up with the gun pointed directly at him. The student aimed at police as they arrived, but thanks to Brogan, who pushed the gun away, when the gun fired the bullet went into the ground. He wrestled the gun away from the student, breaking his hand in the process, but putting an end to the situation before any students were hurt. Brogan is nominated to be the assistant secretary for elementary and secondary education, which oversees the office of safe and healthy students, a resource for schools seeking common sense ways to make schools safer. Aside from his hands-on experience, his résumé includes stints as a teacher, a principal, Florida's lieutenant governor, president of Florida Atlantic University, and chancellor of public universities for both Florida and Pennsylvania. Florida governor Rick Scott (R.) contacted the Department of Education in the immediate aftermath of the Marjory Stoneman Douglas High School shooting to request someone from the agency be part of his task force on school safety, but the department was unable to send anybody with actual authority. "We don't have any Senate-confirmed senior staff that deal with the issues Florida wanted guidance on," said a department spokesman. "None of the people you would send to that task force have been confirmed." Among those still waiting to be confirmed: Mitchell Zais, nominated last October to be deputy secretary for education, who became South Carolina's superintendent of education after a 31-year career in the U.S. Army, where he rose to the rank of brigadier general; and Carolos Muniz, a former top Florida law enforcement official nominated to be general counsel last June. "These are the kind of people you want at the table providing the president with guidance and leadership about the best policies to put forward, and they can't do it because the Senate will not confirm them," said the spokesman. "You have people with a wealth of experience, which is why they were nominated, who each have unique qualifications on the topic of school safety." 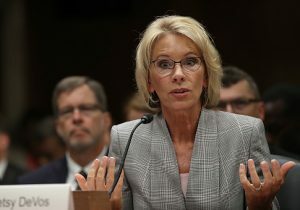 The Department of Education has had just three officials confirmed since Vice President Mike Pence had to cast the tie-breaking vote to get Betsy DeVos confirmed to head the agency more than a year ago. DeVos cleared through the Senate Health, Education, Labor, and Pensions Committee without a single Democratic vote, and not a single nominee for the department has received a single Democratic vote since. No agency has had fewer officials confirmed than the Department of Education. The department puts the blame on the committee's ranking Democrat, Sen. Patty Murray (Wash.), who it says is blocking qualified nominees for no reason other than to appease teachers’ unions. "Sen. Murray would rather keep qualified candidates on ice to appease the teachers' unions than allow that expertise to be brought to that department," the spokesman said. "Yet nobody has transparently made an argument about what makes these people unqualified, other than the fact that they support the president's policies. "These are the people that would lead the advisory role on a day-to-day basis." Murray's office did not respond to requests for comment on the department's claims that the obstruction is inhibiting their ability to assist with school safety. Other Democratic members of the committee include senators Elizabeth Warren (Mass.) and Bernie Sanders (Vt.), who have consistently voted against Trump administration nominees. Brogan, who still hasn't even been cleared through committee, is currently the department's acting secretary for post-secondary education. He joined Gov. Scott's Florida roundtable but Senate rules prohibit him from directly interacting with the office he is nominated for until he is confirmed, leaving him without a staff or any authority to implement any policy proposals. The department says it has received numerous requests to participate in the conversation on how to enhance school safety, including a possible interagency task force that may be convened by the White House. It says DeVos is unable to participate in all of them and needs her support staff for the agency to properly provide the advisory role. "We are over a year into the secretary's tenure, and we've been given essentially no one," the spokesman said. "If you want a functional department of education, you should want competent staff to be there."